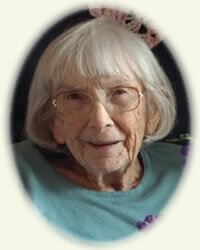 Obituary for Charlotte (Phillips) Wimett | Rhoney Funeral Home, Inc.
Of Lewiston, NY passed away January 1, 2019. She was born in Scranton, PA on October 26, 1918, daughter of the late Lawrence and Ann [McHale] Phillips. Mrs. Wimett was employed as an accountant for many years. Mrs. Wimett was the wife of the late William R. Wimett who passed away June 16, 1993. She is survived by her nephew William Stuermer and nieces Patricia (Phil Reinboth) Stuermer-Roberts and Mary (Glenn) Murray, great-nephew Steve (Jennifer) Murray, great-great-nieces Laura and Mary Murray, and close friends Mary Kay Siemucha, Carol Caswell and Michael Shaw. She was loved and admired by all who knew her. Rest in peace Aunt Charlotte. She was the mother the late Thomas Wimett, sister of the late Ann Stuermer and Katherine Philips. Thank you to all of you who cared for her. A Memorial Mass will be held on Wednesday, February 6 at 6:30PM at Immaculate Conception Church, 4671 Townline Road Ransomville, NY, with the Rev. James Bastian officiating. Interment in Bath National Cemetery.